1. The county is growing slowly, but still adding a lot of people. 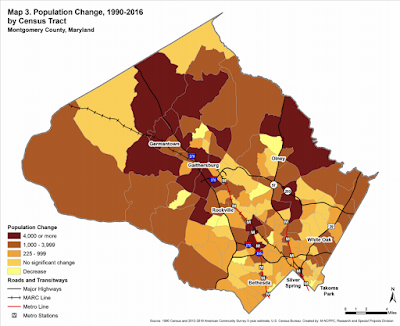 During the 1950s and 1960s, Montgomery County grew really fast, doubling in population each decade. These days, it’s adding new people at a much lower rate—but with over one million residents, that’s still a lot of people. County planners anticipate 208,000 new residents in the next 20 years. Montgomery County is growing near Metro and on the fringes, but many close-in neighborhoods aren't growing at all. All following images by Montgomery County Planning Department. Someone looking at the cranes over downtown Silver Spring or Bethesda might assume that the county's growing really fast, but planners note that we're actually adding fewer homes than at any time since the 1990s, and most homes being built are in a handful of neighborhoods. As a result, most new residents are going to the handful of places that are growing: the far suburban fringe, like Clarksburg and Olney, and areas around Metro stations, particularly downtown Silver Spring, Grosvenor, White Flint, and Twinbrook. 2. 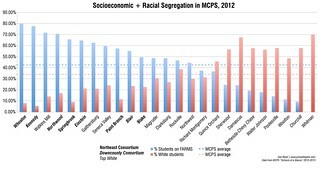 The county is getting more diverse, but not evenly. The county became majority-minority for the first time in the 2010 Census, and planners found that many neighborhoods across the county are pretty mixed, with no majority ethnic or racial group. At the same time, the east-west divide is still very real: as East County and the Upcounty become more diverse, west side communities like Bethesda and Chevy Chase have simply remained white and affluent. 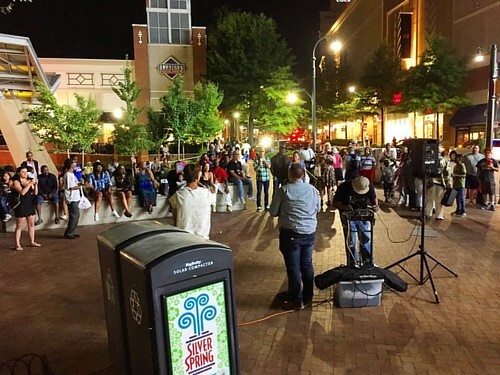 One exception: close-in Silver Spring, which has become both more diverse and wealthier. 3. This isn’t just a place where people raise kids anymore. 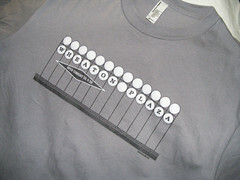 The sitcom the Wonder Years, which was set in the 1960s and loosely based on the writer’s childhood in Silver Spring, depicts a MoCo of homogeneous, nuclear families. 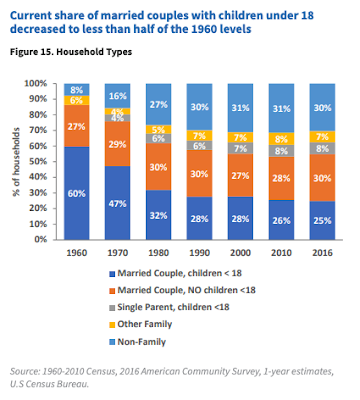 Today, households with kids make up just one-fourth of the county’s population, down from 60% in 1960. Those families are getting bigger: the average household size has increased from 2.65 people in 1990 to 2.77 people today. Families with kids make up just one-fourth of Montgomery County households. What about everyone else? The county has more older residents whose kids have grown, and planners anticipate that we’ll have fewer and fewer working-age people in the future. Meanwhile, one-fifth of the county are Millennials, who either don’t have kids yet or aren’t planning to have them. ​​4. Our neighborhoods are changing, but not in the way you think. Teardowns, or when an investor knocks an older house down and replaces it with a new, usually much larger home, were a big presence in many close-in communities before the Great Recession. They've returned in a big way—as have flips, or when investors buy a home, quickly renovate it, and sell it at a higher price. 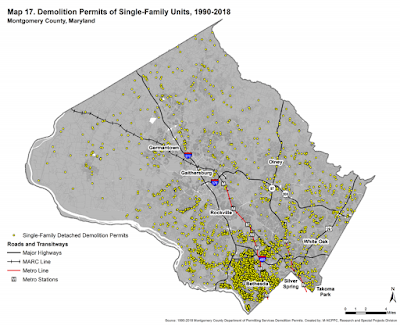 County planners found an average of 230 single-family home demolitions each year since 2013, over half of which are in Bethesda, where entire blocks have been transformed. Teardowns or flipped houses can often sell for two or three times their original price, which has a big effect on a neighborhood's affordability. According to county planners, the average value of a single-family detached home in the county is now $675,594, 40% more than it was 20 years ago adjusted for inflation. The new homes are more expensive, but they also don't increase the number of homes: many inside-the-Beltway neighborhoods where teardowns are common have actually lost homes since 1990. In other words, lower-income households are simply being swapped out for higher-income households. 4,400 single-family homes have been torn down and replaced since 1990, mostly around Bethesda. And despite recent comments about the loss of affordable housing in Montgomery County, planners found that there have been only six instances where apartment buildings were demolished. Their replacements have actually added over 1,000 new apartments, including more affordable homes than there were before. 5. Incomes have been flat for 30 years, which means homeownership is now for the old. 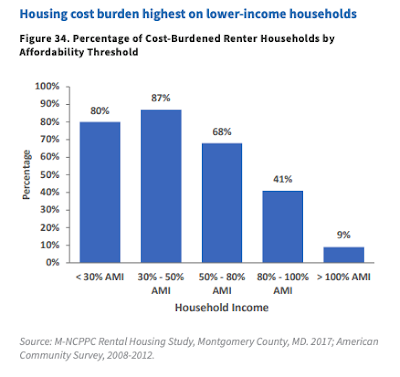 Over one-third of Montgomery County households are renters, and they're not just living in apartments, but in townhomes or single-family houses that are being rented out. County planners found that incomes in the county have been flat for the past 30 years, once adjusted for inflation. One consequence is that homeowners are getting older, as rising prices mean that people who bought their homes decades ago can't afford to move, and younger residents can't afford to buy their homes anyway. In 1990, people over 55 owned one-third of the county's homes and people under 34 owned 18% of them. Today, adults over 55 own 54% of the county's homes, while those under 34 own just 7% of them. Households at all income levels report spending a lot of their income on rent. Many of those people may continue renting, and some might find it a better deal. After years of rising, rents have stabilized in recent years as new apartments are built. That said, 40% of the county's renter households are spending more than 35% of their income on housing costs, a standard measure of affordability. And that cuts across all income levels: 80% of households making less than 30% of the area median income (about $30,000/year) say they're cost burdened, but so do 40% of households making 80 to 100% of the median income (about $80,000-$100,000/year). 6. Most people who live here also work here. Montgomery County hasn’t been a bedroom community for a long time. Nearly 600,000 people work here, and planners found that about 61% of them also live here. In fact, the percentage of people who leave the state to work in DC or Virginia has actually gone down a little. 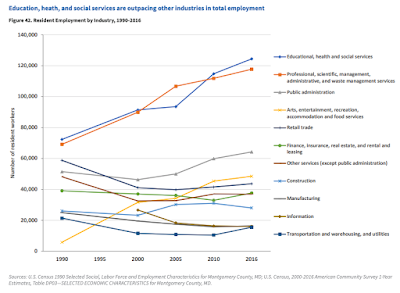 More people work in education, professional services, and food services than they did in 1990. While the area has a reputation for having a lot of government workers, just 15% of the county's workers work for the federal government. More people work in the “eds and meds” fields, like education or health care, in the hospitality or food service fields, as well as what’s called “professional work,” like lawyers or consultants. 7. There’s a shift in where people work. Office vacancies in Montgomery County are the highest they've been in over a decade, in part to changing work habits like telecommuting, coworking, and smaller offices. Twenty years ago, the county's most prestigious business addresses were along I-270, and while office buildings in older, urban communities like Silver Spring struggled to find tenants. Today, it's the reverse: downtowns like Bethesda are attracting companies like Marriott from suburban office parks, which are now struggling. These findings and others will help the Planning Department make recommendations for how the county should grow and change over the next 50 years. They will come out over the next year or so, and when they do, you'll be able to give your feedback on it. Then, it'll go to the Planning Board, and eventually the County Council, for review and approval. What did you see in the report? And what would you like to see in Montgomery County over the next 50 years? Let us know in the comments.